Fortuna Kurhaus Prag is situated directly in the centre of Frantiskovy Lazne spa resort, opposite to the upper park on one side and the city theatre on the other, just a few steps from the spa course of events and the pedestrian zone. 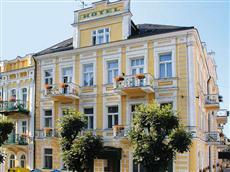 The hotel offers comfortable accommodation, perfect services and pleasant ambience. This, together with hotel owns spring, swimming pool and spa centre will make your stay unforgettable. It provides accommodation in 78 single- and double-bedded rooms, some of them even with a balcony. All rooms are equipped with: • Color TV with satellite channels • Direct dial phone • Refrigerator • In-room safe box • Bathroom with shower or bathtub and toilet. All rooms are non-smoking. Service: 24 hours medical care is ensured by our own doctors and medical staff. Health check-up with a wide range of medical procedures. (4-5 daily). • Socializing room • Smoke room • Front desk 24/7 • Hairdryer and Iron available at the front desk • Secured parking - surcharge • Internet access available -surcharge • Bathrobe rent available - surcharge Treatment: Thanks to its skillful use of the local natural resources: mineral waters, gases, and the nearby peat deposits, Francis bad has become a world famous spa for treating women’s disorders, cardiovascular disease and disorders of the motor apparatus. Fortuna Spa Hotel Praha continues in this tradition.